One of the assignments in the Rockstar Scribe course I’m taking through Alphachimp University (affiliate link) is to sketch where you want to be in five years. This is my sketch. What does that mean for 2013? Work: I’m focusing on business idea validation, sales, and marketing this year. It’ll mean scaling down my consulting income, but I think the opportunity cost will be worth it. To keep building other market-valued skills, I may still do a little web development – primarily for my own projects, but possibly for others as well. Relationships: I’m focusing on spending time with W- and friends, especially through exercise and cooking. I’d also like to organize things more at home, and to learn more kitchen skills. Life: Regular exercise supports my goals here as well, and so does organization and decluttering. I’m looking forward to digging deeper into Emacs for planning and organization, too. Learn: I’ll research and go to interesting events to sketchnote. I’ll also keep an eye out for good books to review. Share: I’ve sketched out an editorial outline of things I want to write about, which may help me write with more deliberation. Scale: I’m documenting many of my ideas and processes in a public manual, and I’ll add more as I learn how to scale up. Imagine you’re a conference or event organizer. You want to make sure your attendees get a lot of value out of your conference, and that a lot of potential attendees hear about it so that they’ll sign up for the next one. That’s why you’re using social media, you share slides, you’re working on getting videos uploaded, and so on. BUT you’re still only engaging a small fraction of your potential audience because most people don’t have the time to review all the materials, people aren’t interested in wading through lots of slides or text, or the materials are published long after people have gotten distracted by something else they need to focus on. Sketchnotes can help you help your participants remember and share key points from the conference, increasing their ROI (and yours!). By sharing these images, people become ambassadors for your conference. This is about helping organizers engage participants through digital sketchnotes that are published throughout the event, taking advantage of the Twitter buzz. Sketchnotes can offer more information and more context than live-tweeted quotes, and they can reinforce the conference brand and sponsor relationships through templates. included in every sketchnote. After the event, these notes also help participants remember and share key points from the conference. People can feel overwhelmed by all the great ideas they’ve picked up from a conference. When they get back to their offices, they probably need to justify their participation in the conference by writing a report on what they’ve learned. Few people have the time to review slides or re-watch videos. Conference sketchnotes are a quick way to trigger memory, and they can also be shared with people who have not been to the talks. This additional value gives conference organizers a good reason to follow up with participants after the event, which could influence feedback survey completion rates and scores. Sketchnotes can also help organizers pre-market the next event. 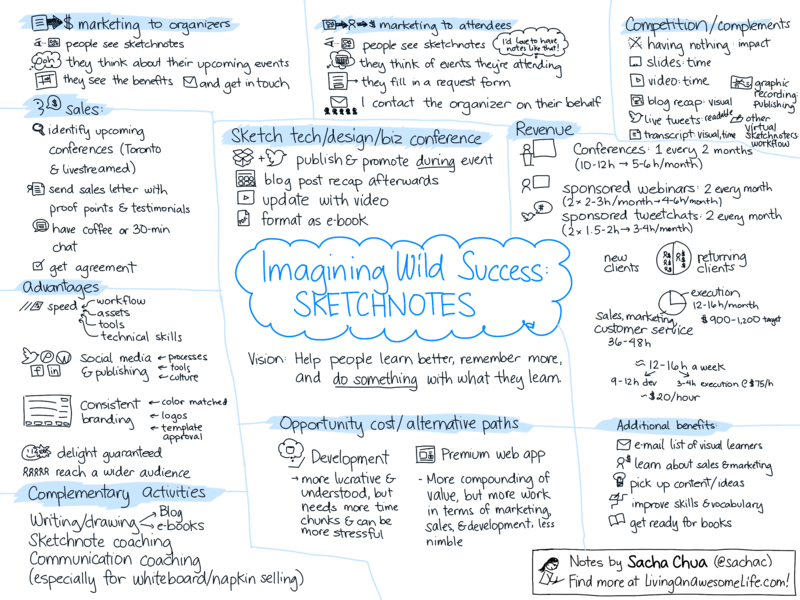 As a quick proof of the content covered in the conference, sketchnotes can spark interest in a way that slides may not. Often tweeted, reblogged, and searched for after an event, they’re an excellent way to share great ideas. One of the great things about this is that I don’t have to build a market from scratch. Bloggers and live-tweeters are now part of many conferences’ social media and marketing planning, so there’s an established need for real-time sharing. Video/slidesharing is part of many conferences as well. Many companies and conferences have worked with graphic recorders and facilitators to capture and share discussions. Doing nothing: No cost. However, this misses out on the opportunity for engagement. Live-tweeting: Often on a volunteer basis, although sometimes there’ll be a small team dedicated to monitoring, responding to, and posting on social media networks. Live tweets are good for engagement, but are difficult to curate or read afterwards. Live-blogging: Often on a volunteer basis, or in exchange for admission. Variable quality and shareability. Sometimes results in lots of text that people don’t enjoy reviewing afterwards. Posting the slides: Many conferences post slides on Slideshare, Lanyrd, or similar sites. This tends to be a split between presentations that have too much text in them and take much time to review, or presentations that have practically no text in them and are impossible to share with people who have never been to the conference. Posting the videos: This can take months, if it gets completed at all. It takes time to review these and find the key points. Transcripts: Very few conferences post transcripts of talks. It’s expensive and time-consuming, although transcripts can increase the searchability of a talk. Graphic recording / facilitation: Excellent for discussions. Visually impressive, as artists work on huge sheets of paper at the front of the room. Can be distracting if people are tempted to watch the graphic recording instead of watching the speaker. Takes time to post-process the images for posting, so not well-suited to publishing during the event itself. Less flexible when it comes to content because it’s hard to erase or move segments of a drawing. Matching colours, adding logos and sponsor information, and using other template elements may not be cost-effective. I speak, too! People enjoy my practical, down-to-earth illustrated talks, and hundreds of thousands of people have viewed my presentations online. Most conference and event organizers won’t be looking for sketchnoting in particular, so I’ll want to start by identifying potential clients, reaching out to people, and figuring out the possibilities together. Another way to find potential clients would be to work with event producers who help organize lots of events. 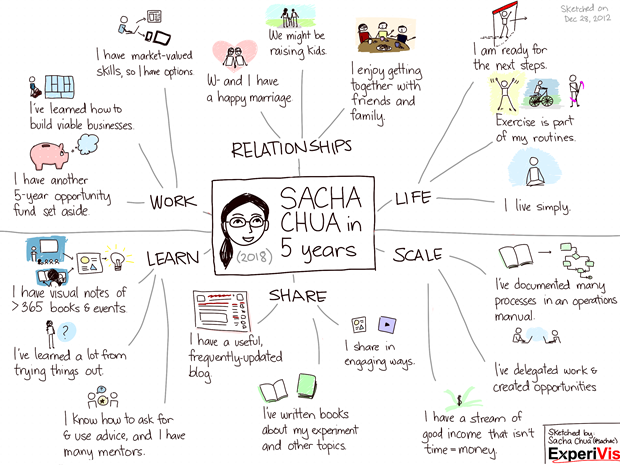 Sketchnoting becomes another capability they can offer to clients in order to add value. People might not know how to make the most of sketchnotes as a resource. By handling the social media publishing and coordinating with the event’s social media team, I can simplify the process. I’ll also put together a guide for organizers who have existing blogs, Twitter accounts, Pinterest accounts, and other publishing platforms, so that they can take advantage of the sketchnotes that they’ll have. One of the reasons I’m interested in building a business around sketchnoting is because I want to learn more about sales and marketing. I could learn these business skills using web development or consulting instead, but those engagements involve longer iterations and less tangible services. Sketchnotes are easy to appreciate and share. In addition, sketchnoting business and technology events also helps me build my visual communication skills, my understanding of topics, and my archive of content. This will come in handy when I write more books and work on more experiments. I think there’s room in the world for more visual books like the Sketchnote Handbook, especially as we shift towards reading less and wanting to understand things faster. I think that sketchnoting might turn into an interesting 12-16 hour/week business that takes advantage of and fits in well with complementary strengths. Looking forward to trying this out! The more I explain this 5-year experiment to others, the more I understand it myself. =) I thought I’d spend some time thinking about what I wanted out of experiment and what wild success looks like, so that more people might be able to help me along the way. I think the period of five years because it usually takes about that long before a business can be solidly established. Shorter, and I might mistake the fluctuations of figuring things out for long-term difficulties. Longer than that, and I might drift aimlessly without self-imposed goals or deadlines. Telling myself that I’ll take a close look at where I am and reevaluate my decisions in five years means that I can plan and budget for a fixed time period. Controlled uncertainty. So where do I want to be on February 19, 2017, the 5th anniversary of starting my own business? What do I want to be able to say? What do I want to have done? Let me fast-forward to my future 34-year-old self and think about what that blog post might look like. Here we are, five years after I started. I’ve learned a ton in the last five years. It turned out that making things happen isn’t anywhere nearly as scary as I thought it might be. I’m looking forward to bringing even more awesome ideas to life. I’ve been so lucky to start with something that people immediately wanted and needed. Through consulting, I was able to help people take their businesses to the next level. I worked with amazing people who not only helped me take advantage of my skills and experiences, but also helped me develop new skills. We successfully transitioned all of my responsibilities, and they’ve turned that work into wild successes of their own. Consulting allowed me to self-fund further experiments. I shared opportunities with other people, working with virtual assistants and other team members in order to get even more out of each day. In the course of training them to take over many of my processes, we built an operations manual that makes it even easier to bring new people on board. Many entrepreneurs’ growth is limited by their ability to trust and delegate, and by the network of people they have. Although I’ve also had my share of rough relationships, I’ve had the pleasure of building an amazing team with skills and passions that complement my own, and I reached out to an even wider network of people I can help and who can help me. Many of the people I’ve worked with have grown their own businesses into something they love doing. Although I was tempted to continue consulting because it was familiar and comfortable, I eventually pushed myself to try other business models. I learned how to validate business ideas by talking to people and prototyping concepts, instead of simply building something and hoping people will come. It was also tempting to continue with the first new business as a job, but I pushed myself to grow out of it, bringing other people in so that they could make the most of those opportunities when I learned even more about creating businesses. I learned so much along the way, and I’m glad I’ve been able to put them together in different books – at least one for every year of my experiment. I’ve shared what I learned about networking, productivity, delegation and automation, visual communication, entrepreneurship, business, and making things happen. Taking notes along the way really helped, and so did pushing myself to have interesting and novel experiences. I’m glad that so many people have found the books useful, and I’m sure my parents get a kick out of seeing me in print. I’m now much more comfortable with reaching out to people and inviting them for lunch or coffee. I always learn lots of things in the conversations, and following up has become its own pleasure. I even host events so that I can bring people together. In terms of paperwork, my attention to detail and comfort with numbers really paid off. The accountant helped me keep all of my books in order, and the CRA auditor found it easy to verify my records. In my personal life, I continue to be the luckiest person in the world. W- is fantastic, and home life has somehow managed to keep getting better and better. We’ve got a solid financial foundation, and are excited about the possibilities. What do the next five years hold for us? I’m not sure yet, but I’m sure it will be a good adventure. I wake up at 5:00 AM to opera, light, colors, cats, kisses, or whatever gives me a great start to my day. I exercise a little to get my blood flowing, and I have a healthy breakfast of steel-cut oats or fresh fruit. Then I gear up for a morning of creative work, settling into a comfy chair or setting up on the kitchen table for a four-hour session of brainstorming, writing code, and preparing articles and presentations. I snack on fruit and nuts along the way. I have a light lunch or head out to lunch with friends. Then I tackle more routine tasks: responding to mail, following up, editing and formatting documents, testing code, taking care of chores, reviewing delegated work, and other things. I make dinner and enjoy it with people I love, and spend the rest of the evening reading or enjoying people’s company. After tidying up and taking care of other things, I go to bed, happy with the work I did that day. I’m close to that, but I’m not quite there yet. My Fridays are shaping up that way, though, and we’ll see how things go in September. I have even more wonderful relationships with family and friends. I regularly stay in touch, and have good notes on what people are interested in and are up to. I survived my first business tax return, yay! I’m now investing in building skills while giving back to the community, eventually turning that into income from mobile apps, illustration/animation, and other ways to create value. I’ve got lots of sketchnotes of meetups, books, and product reviews. I’ve organized them into a blog and an e-book. My sketchnotes have colour and depth and interesting layouts. =) I help people find out about useful stuff and good get-togethers. I’ve updated my Stories from my Twenties e-book with what I’ve learned from my 29th year, and I’ve shared the updates with the people who bought the book and sent me their receipts. I’ve gone through Lingua Latina Per Se Illustrata, and I understand it. =) I’m also picking up Cantonese. My finances are on track for my 5-year experiment; this might even be extended at least a few more years. I’m ready to rock my thirties! 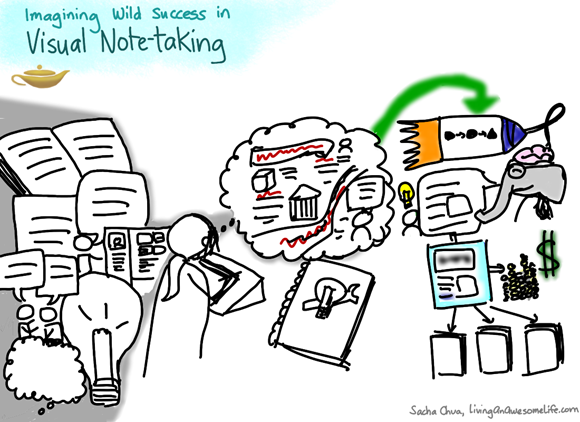 Here’s what I want when it comes to visual notetaking. I’m going to go through thousands of books, presentations, blog posts, conversations, ideas, and thoughts in my lifetime. Maybe even millions of these little pieces of content. I want to get really good at remembering, reusing, and sharing the significant ones, a tiny fraction of the whole. I often refer to ideas I’ve picked up in the past. I recommend books to others. I review items to see if I’ve been applying the lessons I learned, and if there are more I can use. Sometimes I come across unexpected combinations – part of one book resonating with a presentation on a different topic mixed in with a conversation I’ve just had. I benefit from holding these ideas near working memory. Like the way I can flip through a slideshow faster than I can speedread a book, it might be easier and faster to review an archive of visuals than to refresh my memories using text notes. If I can convert some of this abundance of content into visuals, then I can use that to get around the limitations of time, attention, and memory. Maybe other people will find the sketches useful. Maybe I’ll scale up and work with other illustrators, readers, and writers. Even if I don’t, though, I think that having these visual notes will make it easier for me in the long run. Here’s a project for myself: convert my book notes into sketches. I could do the Lean Startup thing to find out if other people would be interested in the idea before I invest a lot of time and effort into it – mock up a minimum viable product with payment options or a subscription model. But then I want something like this for myself, too, so it’s okay to spend some time figuring out what I want before pitching it to others. What would wild success look and feel like? I have visual notes for the key ideas I want to revisit. I flip through them rapidly once a day, and rotate my desktop or screensaver through random ones for serendipity. They’re searchable through Evernote and accessible even when mobile. I’ve posted many of them online. Subscriptions, book reviews, and advertising provide a stream of income. People recommend other books and ideas I should check out. I occasionally do sketchnotes on commission: simple sketches of key ideas captured in real-time during webinars or recorded presentations, used for marketing and post-session follow-ups. I also sketch summaries based on blog posts, e-books, or books sent to me. I do the occasional meetup or lecture as well, taking notes on my laptop. Focusing on electronic content means that I don’t have to travel or lug large rolls of paper around, and it takes advantage of my setup with multiple monitors. In addition to sketchnotes, I offer or coordinate useful complementary services: presentation planning, design, coaching, transcription, e-book creation, writing, and so on. These help people scale up their ideas and engage more people. My visual style is crisp, simple, with visual metaphors and the occasional pun. I usually work with one or two accent colours, and have figured out how to draw people with character and objects that have some heft. I draw in high-resolution mode just in case I want to make a letter-sized print of something, although I’m okay with redrawing in case I want to make a poster. Most of the time, I work at a standing desk I’ve rigged up facing the garden. I take breaks and go for long walks, or do some gardening. Sometimes I go to art galleries to immerse myself in colour and shape and line. I keep a digital notebook of things I like: title treatments, hand-lettering, colour combinations, visual metaphors, drawing techniques. I flip through it for inspiration, and add my experiments to it as well. I use my sketches as anchors not only for ideas, but also for memories. Like the way people flip through their photographs, I go through my sketches. I like it because I can sketch scenes that I didn’t get to shoot, and I can draw them the way they felt like instead of just what I saw. Drawing has become a part of my life, and I sketch regularly. I’ve even started drawing on paper, using ink and markers. So, how do I get closer to that? I’ll start with the sketchnotes, because that would be a great way to review things, develop style, and practise the craft. As I accumulate more notes, I’ll put them in a special section of my blog so that people can read them easily. I already have the standing desk (actually a kitchen chopping board). When I want to take a break from making sketchnotes, I can draw memories or fiction. Looking forward to it! What’s success when you’re writing a personal blog–not a niche blog which you want to make money from through ads or e-books, not a corporate blog where you want to project a certain brand, but a personal blog, a notebook into which you write whatever might be useful to you and others? Success is not a matter of becoming wildly popular. You succeed as soon as you grasp a thought and try to think it through, writing it down. Even if you throw away your draft and never publish it (although please do–you’ll be surprised at how valuable these sketches and attempts to explain can be), you have already gained a little more clarity and understanding. You succeed again when you share those thoughts, getting over your fear, anxiety, and discomfort. You succeed again when you look up your old posts for a solution you’d written down or a reflection you’d shared, saving you time figuring things out again. You succeed again when people read your post–even several years later, brought in by search engines–and they learn something from it. You succeed again when they do something about it. You succeed again when one comment turns into another, and into a serendipitous connection you might never have made. You succeed again when you learn something, and again when you do something about it. You succeed again when you build friendships. There are so many different kinds of success in blogging. Don’t get distracted by all the fuss about increasing your subscriber count, building your personal brand, or making money through ads, products, or services. There’s more to it than that. Enjoy!